Yes, just for the fun of it, my header image is of last week’s recipe – the rollie pollies that I neglected to post about. Little cinnamon-sugar, pie dough scrap treats. I’ve been making a variation of these with scrap pie dough since I was a kid, and I’ve never thought to squash them flat like cookies! If this week’s Baking Bible recipe didn’t involve so much waiting, it might belong on the quick and easy list. As it was, it was one of those recipes I really appreciate on weekends when I’ve got a lot of things going on: there’s not necessarily a lot of active time in the kitchen, but there’s an impressive looking payoff at the end. I briefly considered making a baguette (or two) from scratch for this, but if I did that, there was no way it would be “stale” in time for a proper bread pudding. Oddly enough, it was actually tough to find a pre-made baguette. My regular grocery store was all out, and it turns out that there just aren’t a lot of bread bakeries super convenient to me. I guess it’s good that I do most of my own baking! Immediately after I got home from my baguette quest, I sliced it up and left it on the counter to dry out overnight. I’m not very good at pouring without making a mess. 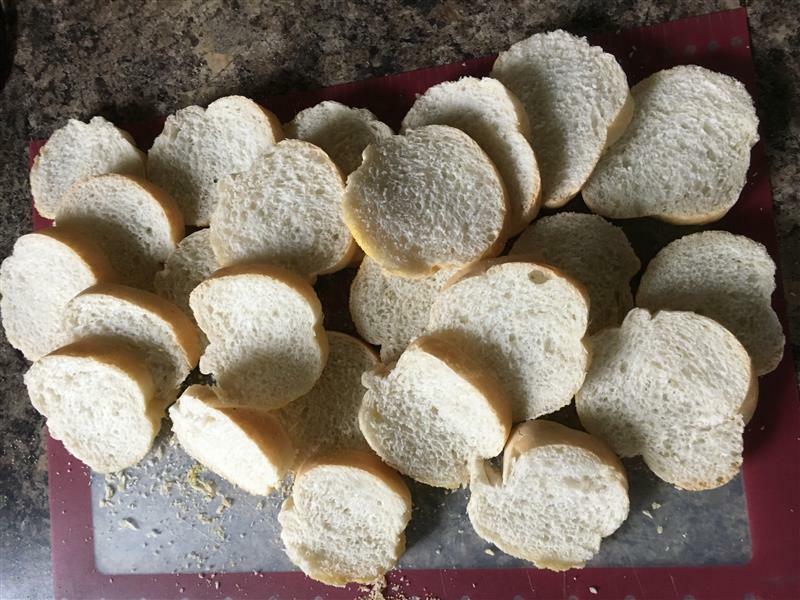 Nestle the toasted bread slices in the liquid, let it soak for a while, then flip the slices over and let them soak again. Some of the words in the recipe didn’t make a whole lot of sense to me at this point. It said something about cut side down, but I couldn’t find anything about cutting the slices in half. 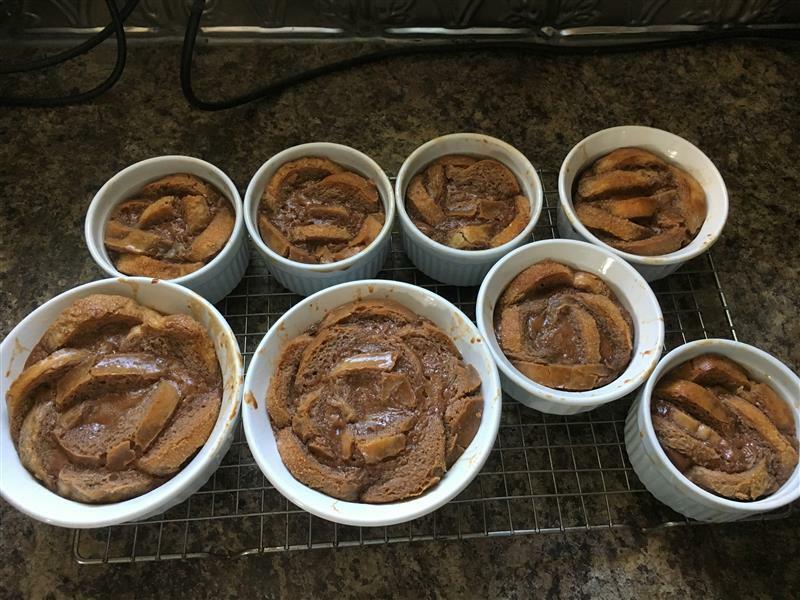 So, when I went to soak them, I split each slice in half – partly because “cut side down” makes no sense otherwise, and partly because I logic-ed out that the full rounds wouldn’t necessarily fit in the souffle molds very nicely. 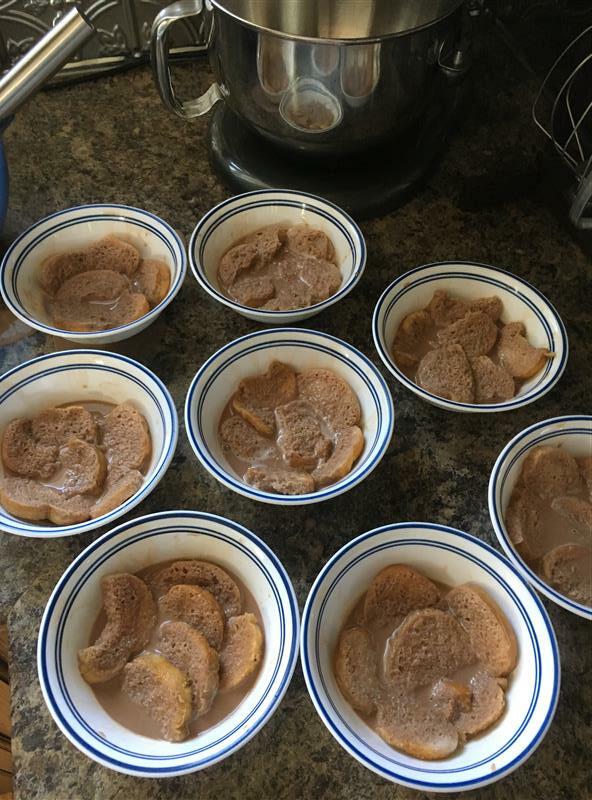 Once the bread is thoroughly soggy, arrange it in overlapping rounds in the souffle molds. It kinda sorta looks like a rose, if you squint. My slices may have been too thick. Roses ready for the oven! 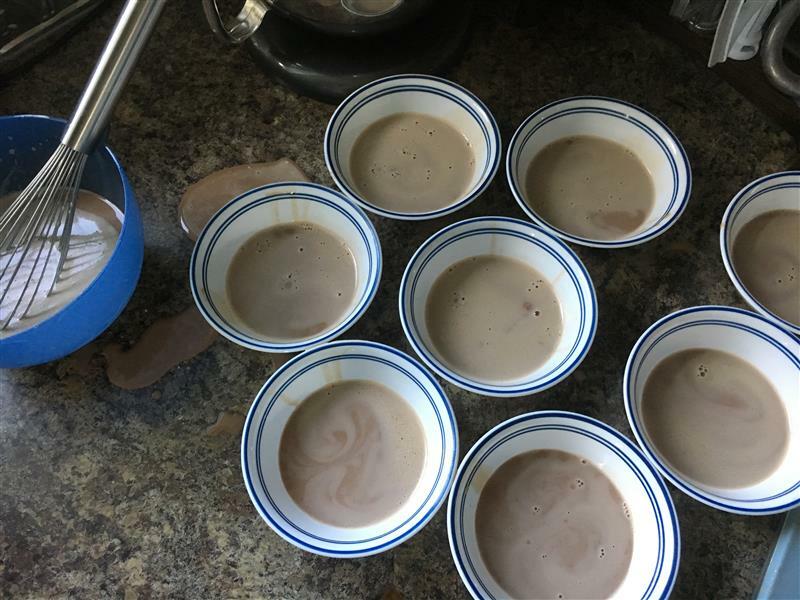 Like any good custard (which includes cheesecake), these should be baked in a water bath. I cheated. I couldn’t find my cake pan that would have held all of these molds and some water. So, I turned the oven down a little, checked them early and often, and pulled the small ones from the oven a while before the big ones. Verdict? Well, it was certainly an appropriate dessert for my first full weekend at home after 2 weeks in England! Somehow, despite the chocolate advantage here, I think I actually like more traditional bread puddings (with raisins! and vanilla custard!) a little better than this one. That being said, my first trial of it was cold. Maybe I’ll like it better warm! Posted on September 20, 2016 by KristinaPosted in The Baking BibleTagged bread pudding, custard, milk chocolate. welcome back! your bread pudding and your Rollie pollie looks great! 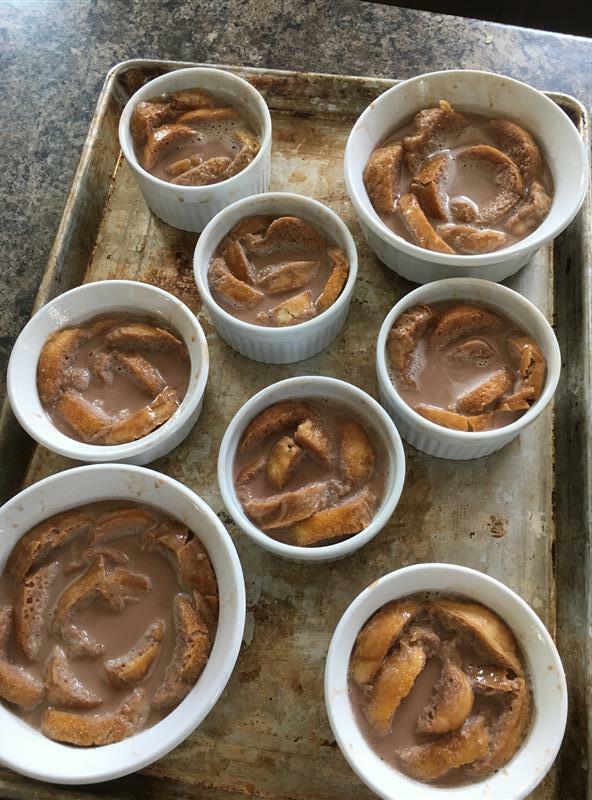 I took one look, and thought, That looks more like the rollie-pollies than the bread pudding. Duh. I can definitely see a couple of roses there. I thought the instructions were confusing too. Looked like you enjoyed your time in the UK.